Commercial rafts can potentially flip over in Class III, IV or V whitewater rapids. Rafts could capsize in very large waves, hydraulics or by hitting rocks. Most flips can be avoided by skillful guiding and good paddling by the crew. However, sometimes Mother Nature wins the “battle” and a raft can turn upside down in whitewater rapids. When a raft flips over, there will be moments of concern for yourself and others. First, remember the basic instructions that you heard before your raft trip – get your feet up to the surface of the water and try to get a firm hold of the raft as quickly as possible. Keep holding the raft and wait for instruction from your guide. Do not let go to help others who are not holding the raft. Reach out to grab them or encourage them to swim to the raft. After a raft capsizes, the guide will get on top of the raft. 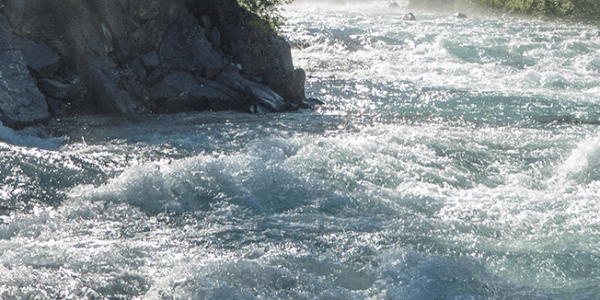 If the whitewater is heavy and there is a long way to go in the rapids, the guide may choose to leave the raft upside down and pull paddlers on top of the upside down raft and ride out the rest of the rapids this way. The raft would then be righted at the bottom of the rapid in the next calm area of the river. In this case, wait for the guide to help you onto the upside down raft. This will be easiest at the bow or stern, front or back, of the raft. Work your way toward this area of the raft so that the guide can quickly pull you onto the upside down raft. Once on the upside down raft move away from the guide and toward the middle of the raft. In the middle of the raft stay low and hold onto whatever is available – a flip line rope, self-bailing drain holes or a raft handle. When the raft reaches calm water, slide into the water and wait for the guide to flip the raft back to the upright side. If a raft capsizes and it quickly enters calmer water, the guide will likely choose to turn the raft upright immediately. In this case, the guide will tell you to let go of the raft and move away several feet while they flip it back over. After the raft is flipped back upright, get to the side of the raft to be pulled back in by the guide or other paddlers. Often when a raft capsizes one or more passengers will come up under the upside down raft. There are large air pockets under the raft, so quickly take a few good breaths while keeping your feet up. Do not linger under the raft, however, because you cannot see what is coming next in the river and your crew and guide are looking for you. Take a deep breath and get out from under the raft by pulling and pushing on the bottom until you reach daylight.